1. Completely online and can be taken whilst at work on a PC, or if you wish, from home or other location using a laptop,or a tablet device such as an iPad. 2 . The training covers the core knowledge that engineering personnel should have who are invokved in the torque tightening of threaded fasteners. The training includes quizzes to assess understanding as well as an end of course test. 3 . The pace at which you go through the training is up to you. The LMS (Learning Management System) that the presentations are linked to, will track your progress as you complete the presentations and quizzes. There is a training handbook presenting course notes, example calculations and tables that the user can view and print out. There is a course completion certificate available to those who pass an end of course test. The failure of bolted joints occurs across most industries. Some failures are disastrous resulting in a loss of life. The frequent cause of such failures is that the fastener tightening process was inadequate in some way. With hindsight, most accidents are preventable. In the workplace there is an obligation that a person's competence is managed in accordance with applicable legislation and standards taking into account best practice guidance. The purpose of this training course is to provide advice as to what is generally regarded as best practice guidance in regard to the torque tightening of threaded fasteners. This online distance learning course is designed for engineering personnel who are responsible for, or involved in, the torque tightening of threaded fasteners. The key terms used in regard to bolts, nuts and threads. Understand why it is important that bolts should be fully tightened. Understand what is meant by a torque and bolt preload and appreciate the difference between them. Appreciate the problems and issues that under and over tightening can cause. Have an appreciation that the tightening torque is influenced by lubrication. Identify the different types of torque wrenches. Understand what is meant by a tightening sequence and typical sequences used for circular and non-circular bolt patterns. Understand what is meant by torque auditing and the main methods that are used in practice. A training course handbook is provided as part of the training that can be viewed online and printed out, if required. The handbook contains background information to the material presented on the course. Bolts, screws and studs - what's the difference? Background to threads - the thread form itself, the pitch of the thread, how a thread size and pitch can be checked. The difference between a fine and coarse thread and the reasons why which type is normally selected. Thread tolerances and why the bolt thread must be slightly smaller than the nut thread. Protrusion of the bolt thread past the nut and the number of threads on the bolt within the joint. Blind holes and getting the bolt length correct. The strength of metric bolts and their marking. Styles of nuts - the use of thin, normal and high nuts. Checking that the bolt and nut strengths are appropriate for each other. Bolt and nut head markings and identification of correct components. The use of washers and lock washers. Nut/bolt combinations, nut strength versus bolt strength. The types of self-locking nuts and their usage. What is meant by a tightening torque. Units used to measure torque. Tightening torque and the importance of bolt load. Bolt stretch and joint compression due to tightening. Factors affecting how much bolt load you get for a given torque applied. Background to the torque value and how it is arrived at, use of a torque table. 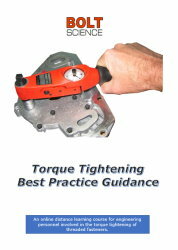 Torque tightening and the lubrication condition. The different types of torque wrench in common usage. Use of a torque wrench and tightening to the specified torque value. The setting of a clicker type torque wrench. An overview of hydraulic, pneumatic and impact wrenches and the use of torque multipliers. What should be tightened, the bolt head or the nut? Under and over torqueing and the implications of each. Tightening to a target value when a tolerance is given for torque. Problems that can arise from overtightening. Issues arising from thread stripping of the bolt thread. Under tightening and fatigue failure of the bolt. Under tightening and self-loosening of the fastener. Why tightening sequences are specified. Common tightening sequences for circular bolting patterns. Common tightening sequences for non-circular bolting patterns. Completion of a check pass. The use of witness marking. The use of loose nut indicators. Residual and break loose torque. The on-torque residual torque auditing method. The static audit torque assessment. Access to the course will be available for three months following the login and password details being provided. Bill Eccles is a mechanical engineer with 40 years experience in mechanical engineering with the last 20+ years specialising in bolting. NOTE: This training does not make any determination of an individual's capabilities in applying this general knowledge within a specific work environment or under actual working conditions. It remains the sole responsibility of the employer of the individual to determine competency for assigned tasks and work.